With pictures of the damage caused by Sandy, the storm of a century, facing us from every media outlet, I can’t help thinking of New York City and all the places I love there. Growing up, I learned much of my history from the statues and pictures in the museums and books from the public library. It was at the Metropolitan Museum of Art that I was introduced to ancient Egypt and became intrigued with its secrets—a fascination I have never lost. royalty in ancient Egypt, but the body is that of a woman, and the inscriptions running down the side of the throne use a female name and title. Hatshepsut’s story has puzzled historians for centuries. She built the largest temple on the banks of the Nile River with paintings on the walls and statues at the entrance. She must have been an important ruler, but her name is not found in the early official lists of Egyptian pharaohs. How can such a powerful woman disappear from history? Well, as has happened with many women over the centuries, it seems to be the men in her life that originally caused her to disappear. She had been born the daughter of a powerful pharaoh, Tuthmosis I and, like many royal Egyptian women, she married her brother, Tuthmosis II, who inherited the throne. 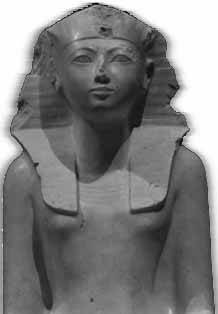 When he died after a short reign of six years, Hatshepsut became regent for their young son who was to become Tuthmosis III. After spending several years as a regent, she apparently decided to rule as a pharaoh in her own right; she was after all of royal blood and knew the job well. She had a long and successful reign during which Egypt was peaceful and became a wealthy country. After she died Thuthmosis III succeeded her. At some point in the half century after her death, many statues of Hatshepsut were defaced so she was no longer recognizable. Her name was chiseled off many of the stone statues and when later rulers drew up the list of Egyptian monarchs, they simple left her name off. Perhaps it was too humiliating to admit that a woman had ruled the country so successfully. At any rate, Hatshepsut’s disappearance was effective. The Egyptian empire lasted for thousands of years, but eventually it disappeared. Many Egyptians became less interested in the arts and religion of the pharaohs. They forgot the old traditions and the Egyptian gods. Egypt became part of the Roman Empire and was one of many Roman colonies. In the year 391, the Emperor Theodosius decided there should be no pagan temples in the empire. All the temples built by Egyptian pharaohs were closed. Inscriptions written in hieroglyphs were hidden. Much of the history of the country was lost. Two centuries or so later, Arabs invaded Egypt bringing the Islamic religion and the Arabic language. As the years went by, Egyptians began speaking Arabic instead of Egyptian. And still the years rolled on. Villagers took stones from the pyramids to build their homes. Tomb robbers stole gold and jewels from burial places. In their eagerness to find treasure, robbers overturned coffins and dumped carefully wrapped mummies onto the earthen floor. The bones of pharaohs and commoners mingled together in heaps of rubbish. Not all memories of Egypt were lost. Greek and Roman historians had written accounts of some of the pharaohs. The pyramids were still visible above the sand. Europeans gradually began traveling to Egypt to find trade routes to India so they could buy spices there. The Bible told stories about Egypt and started scholars wondering whether they could find traces of the ancient civilization there. In 1735, Richard Pococke, an English clergyman, went to Egypt to study its monuments. He made maps showing where the known monuments and pyramids were located. Perched on his donkey, or sitting under a spindly palm trees at an oasis, Pococke sketched the people and places he saw. He stumbled upon Hatshepsut’s temple at Deir el Bahri but had no idea which pharaoh might have built it. No one could read the inscriptions on tombs and statues. More than fifty years after Pockocke’s trip, in 1798, an invading army brought more scholars to Egypt. Napoleon Bonaparte decided to conquer Egypt and claim it and the trade routes it controlled for France. Unlike many generals, he wanted to study and preserve the history of the country not just conquer it. He brought with him scholars and artists as well as soldiers. In the city of Rosetta, a French soldier discovered a stone inscribed with three different types of writing. This remarkable stone, known forever after as the Rosetta Stone, contains the same information written in three different languages. One section was written in ancient Egyptian hieroglyphic symbols, one in a more modern version of Egyptian writing, and one in Greek. Here at last was a key to unlock the secrets of Egyptian inscriptions. Translating the hieroglyphic writing would be difficult, but it was a first step toward unraveling the secrets of the pharaoh who had disappeared from history. In my next post I’ll trace the next step in the mystery.